Just recently I ran a camp for some of the top kids in the province and we discussed routines and the importance of them in squash. I tried to emphasize the importance of prematch, post match and between rally routines. Similar to explaining the importance of warming up or stretching after a match, it's difficult to get across the value of such activities until they're required. When kids are starting out playing squash they simply play and a routine isn't really all that relevant. For those of us that have played a lot of squash we know how vital our routines are to our success. 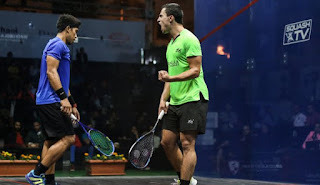 Today we're going to take a look at why routines are important in different areas of your game and how you can use them to play more consistent squash and get the most out of each session. I believe that the mental game is the most important trait in becoming the best you can be. The moment you become satisfied with your level is when you become complacent. Using habits in a variety of ways is how the best athletes stay on track and perform at their best each and every day. Let's go through some of the ways that positive habits can help take your game to new heights. Building winning habits is both about about how you prepare for practice along with how you practice. When it's time to put in the maximum physical effort you do while equally crucial is your focus and attention to detail. I always think about the famous quote about how 'training starts when you want to stop.' This is how some people are better at pushing themselves further and closer to their actual physical threshold. I also like to use an analogy I read in a boo about walking on hot coals to explain this concept. At the beginning we jump off quickly because it's hot and painful, but with practice you're able to push further and further along the hot goals and withstand more pain. We not only need to be able to push ourselves along those hot coals further and further, but we also need to build a habit to do this. If we only push ourselves when we're having a good day and feeling up to it we will never build a true champion habit. I always look at how people do when things are going well. When you're tired, a bit sore or not playing your best do you still manage to give absolutely everything you have on the day? Very few of us actually are able to do this so if you want to start building a winning habit this is an excellent place to start and a great platform to build off of. You don't need talent to give your best effort every single time you practice or play. Having a weekly or monthly plan is another method for building a winning habit. As humans we tend to gravitate towards routines and we adapt to them quickly. Although I'm not a big fan of a full year training plan (especially for kids) I believe that having that weekly routine is another critical way to steadily improve. If we just wait to see what the day brings or how we feel we will likely have days where we are less motivated to go out and train. I think a week or monthly routine keeps you in check, accountable and gives your body time to adapt to whatever it is you're doing. I suggest slightly altering the routine week after week and consider it a working/live document. This is a tough balance to have with the above paragraph where we want to have a hardhat and be mentally tough and alway give it our best. But when we're overtraining or a bit injured or stressed we need to listen to our bodies and know when to ease up a bit. This is something your coach or trainer can assist you with, but is really something you have the best perspective of. As a coach many of us would aide on the side of caution because of liability and worrying about the safety of our athletes so you can see if we are too soft here we will never toughen up and we'll always be looking to cut corners. Do you have a prematch routine? Many people simply show up and get their shoes on and step on court and begin hitting the ball. Clearly if we want to play well from the start of our match this isn't a very successful method. If you ever get a chance to watch a professional athlete prepare for a training session or competition you will see that most have a very specific structure that they follow. This is something they have developed over a number of years and is what they have found works best to allow them to prepare for what is to follow both physically and mentally. To be a high level consistent performer the prematch routine is essential. We all feel different on a day to day basis and it's by going through our prematch or pre-training routines that help us get to a more similar starting point. Any athlete knows that being in the zone is the key to optimal performance and getting into this zone is completely psychological. Although any level of athlete can experience the zone, the consistency of getting into this is what top athletes have learned how to do repeatedly. Being able to play in the zone requires that our self talk is positive and simple. Negative self talk and over analysis are definitely 2 effective methods for playing poor squash. Most people tend to think of a prematch routine simply to warm up the body and avoid injuries, which is indeed part of it, but it is also much much more. As already discussed the variations in performance from 1 day to the next is much more mental than any sudden drop in technical skill. If we're missing shots we normally make it's more than likely the mental side as to why we are making these mistakes and we either stop going for these shots or get tentative with them (which again are both mental issues). Meanwhile someone in the zone still makes mistakes they simply don't let these mistakes register and interfere with the flow of their game and thought process. What about routines during a match? Routines between rallies are also equally important to staying or getting into the zone. We are constantly analyzing our performance and there are swings in momentum for and against us we have to deal with. When things are going well we don't need to think much so we tend to have a shorter routine here. If things are going well we are generally trying to just keep doing what we're doing and avoid thinking too much and judging what we are doing. This is the whole self 1 and self 2 thing discussed in classic book, The Inner Game Of Tennis. If we lose our focus because either we have won a number of points too easily or we begin to see the light at the end of the tunnel we learn how to catch these lapses before they cause any real danger. This is all done with between rally routines which allow us to focus on right now (versus the past or future). If things aren't going well in your match the between rally refocusing routine can help you get back on track. You can use this to slow down the onslaught and break up the momentum. Again because momentum is so psychological what we do and what we think during these between rally routines is so vital to their effectiveness. Sometimes it's about getting back to our game plan or letting mistakes go before playing the next point. What I like to do between rallies is use a cue (wiping my hand on the sidewall). Prior to this cue I allow myself to digest the previous rally and think about what I've learned from it. Once I've wiped my hand on the sidewall I've moved my focus back to the now and whatever happened from the previous rally is now out of my mind, digested and my focus is shifted back into this moment. After all, all we can control is what we are doing right now so don't over analyze what's happened up until now. If you find your focus is on the past or future try using a focused breath to recenter yourself. I always see pitchers doing this in their pre-pitch routines. Not only does a focused breath bring our attention into this moment, but the oxygen is also our fuel and this helps release some tension we may be holding onto. If you have read any sport psychology books you'll know that they all discuss the importance of conscious breathing. Let's discuss post-match routines. If we lose maybe people like to dismiss any routine because they are too upset and don't care. We know that we can recover faster and improve our flexibility if we stretch after our matches, yet still some don't. I believe it's even more vital to stick to your post match routine after a loss so you have time to reflect and again don't carry that loss personally into the rest of your life. You may feel depressed after a tough loss and be upset, which is quite normal. I believe an effective post match routine gives you that time (say 30 minutes) to reflect on what you learned from the experience. After your routine is complete you have to let it all go. Every single squash player ever has lost and will lose or else they aren't actually competing. This is why we love squash. We want to challenge ourselves and become the best we can be and this requires playing people that will be able to beat us. Losing to any caliber of player is simply a time to learn from it and make changes in your own game. Just don't take this loss to hard or personally. If you can let go of your ego and the fear of failure you'll have your best chance of playing to your potential. This is where I feel Fares Dessouky is struggling. He's no doubt the most technically and physically skilled player on the tour, but mentally is quite fragile. This is a shame because you want to root for him because he is so amazing with what he can do on court you just wish he would let his playing do the speaking for him. If he doesn't learn how to use his mind as an asset he will never reach his true potential which would be a real shame for all of us including Dessouky. Perhaps he is just preparing to be the villain and has something to prove to all of us. I'm guessing he grew up in an environment which fostered this trait, but this is also something that has to come from him and nobody else. This is the result oriented world we live in, but he has yet to figure out that playing his best squash is only possible when he stops trying to control the outcome and just focuses on the process of playing his best possible squash each and every rally. I really can't stand all of the discussions, blocking and reactions to the decisions. Sport psychology is such an interesting topic to me and although all the top athletes in the world can vouch for the importance of their mental skills it's still an area under appreciated and under coached. It's tough to understand that you'll win more by not focusing on winning, but the process. You'll play better squash and enjoy it more if you can find your zone and play up to your potential. Take a serious look at your game and see how it measures up to what you would like it to be. It takes time to get to where you will want and need it to be so don't be too hard on yourself if you're not perfect. Try and use routines to improve how you self-regulate and respond to different situations. Also try setting up a weekly or monthly training routine and give your absolute best during each part of each session. I believe the championship attitude and behaviour has to come prior to becoming a champion. Focus on the process, on staying focused, on refocusing when you lose your way and you'll get into the zone more frequently and become more consistent with you performance. Don't wait to become a champion before you act like one. We may not know if the chicken came before the egg, but it's pretty clear that the winning habits must be in place before you can become a champion on the court. Achievement is something which comes only when you work hard for it and be patience. Make proper routine and stick to that sot that you could acomplish the goals. Being focused is the great way to achieve the targets and reach success. Also, it's essential to have faith in yourself as it leads you towards success.